First and foremost, I want to wish you all Happy Holidays and a Happy New Year. 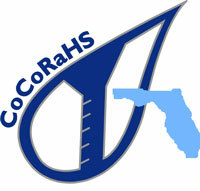 I would like to thank you for your continued support and dedication to the CoCoRaHS program. 2014 is quickly coming to a close and it's hard to believe that we will be starting 2015 in just a few weeks. Next year, we will be celebrating eight years in Florida. If your travels take you away for a short trip or a long journey, please be safe. Especially if any of you are traveling north, like myself, and don't have much practice or remember what it's like driving in whatever frozen precipitation Mother Nature may throw our way. Also, remember to use the multi-day precipitation form when entering your rain totals when you return! If there was ever an observer that deserved 'CoCo-Demerits,' it would be me. November was extremely busy and I only saw my office for 6 days out of the entire month. And because of it, my poor rain gauge became a forgotten friend. When I walked over to check on it, I feared what I would find. Needless to say, it was a mess and had about 7" of gross rain water in it. My resolution for 2015 is to be better about having someone check it when I'm not around. Despite the crazy month, I did get to read through some of the comments. So here are some of my favorite's from November. FL-PB-39 on 11/2/2014: "....windy and cool! LOVING IT!" FL-SW-1 on 11/3/2014: "The high was 62.02 degrees F and the low was 31.80 degrees F. At 2 feet, the low was 28.83 degrees F. I have lived in the Deep South all my life (64 years), and this is the earliest freeze I can remember. This is normally our wet season and we are not getting any rain." FL-HB-10 on 11/18/2014: "After a chilly overnight low of 49�, daybreak brought the look and feel of winter weather, with overcast skies, cold gusty air, and an eventual yet brief noontime daytime high of only 56� at my South Tampa location today." FL-HB-3on 11/19/2014: "41˚F Where's the snow?" FL-MD-59 on 11/4/2014 :"Zilch, nada, zeros - this is getting monotonous now Florida. Where did the rain go? Gee - not even any trace amounts. 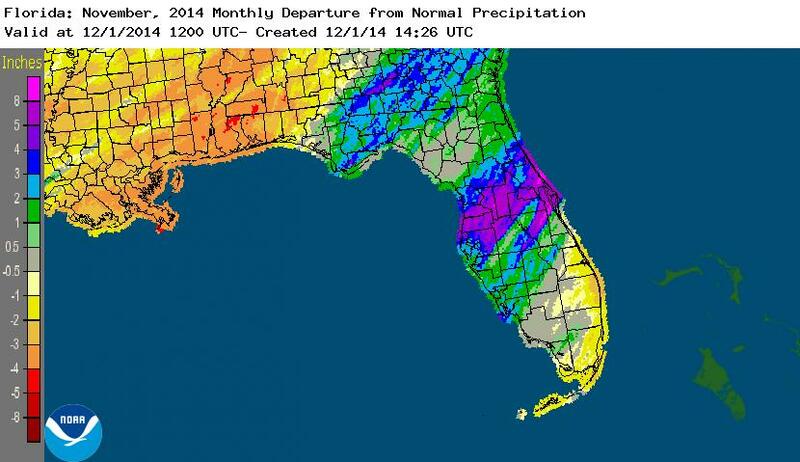 Sigh....."
FL-PK-15 on 11/9/2014 :"Sweet glorious rain! Light rain fell after dark, didn't ever seem to come down heavily unless I slept through it. Still heavy mist falling at 7:30." FL-OK-3 on 11/17/2014 :"Had to delay checking the gauge--too much lightning. Gauge is down on the dock near a sailboat--BIG lightning rod! Temperature 70 degrees around 6 AM--supposed to be in the high 20's tonight. I've already said good-bye to some of our plants." FL-VL-6 on 11/26/2014 :"Strong lightning during passing of the cells. I also saw ball lightning, the fi6.04 between 7:30am and 5pm (significant weather report submitted), then another 1.95 overnight. 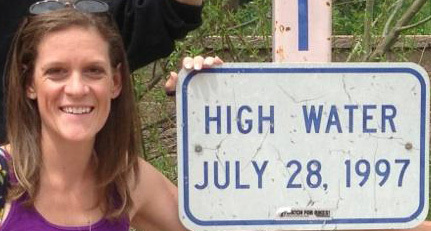 Highest 1 day total in over 5 years of reporting." 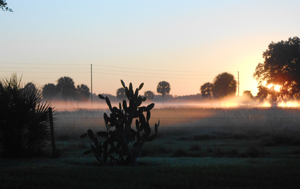 Roger, an observer since 2007, shared this beautiful sunrise picture from his Sarasota County home. Tennessee is a second home to me and I spend a good deal of my down time there. 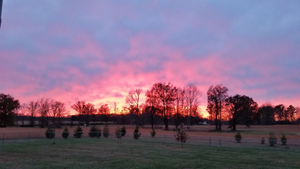 I was fortunate this year to be with my family during Thanksgiving and capture this amazing sunset on the 25th. As you're out and about over the holidays, snap a couple of photos and send them my way. I would love to get some pictures of Florida observers playing in the snow, or playing on our white sand beaches. 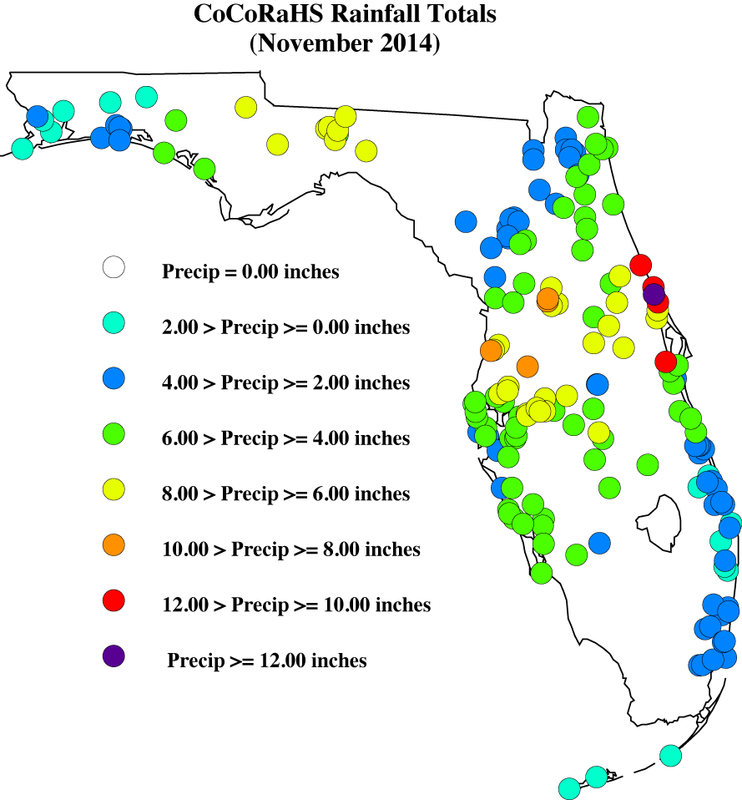 Portions of the Florida Peninsula and Big Bend reported monthly rainfall totals well above normal, while the Panhandle and southeast Florida saw below average rainfall during November (Figure 1). 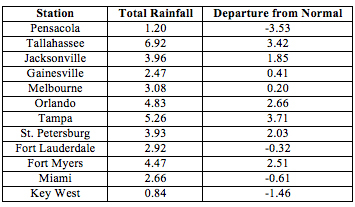 Departures from normal roughly ranged from -3.53" to 3.71" (Table 1), though localized parts of Florida saw rainfall totals that were as much as 5.00" below normal to over 8.00" above normal (Figure 1). 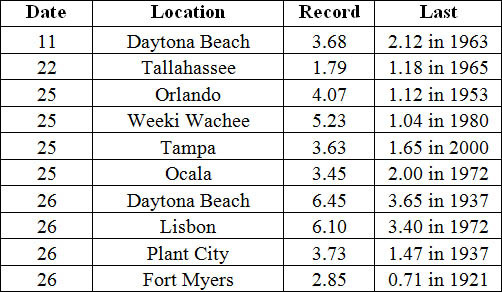 November 2014 was the 3rd wettest in Ocala, the 4th wettest in Tampa and Daytona Beach, the 5th wettest at Fort Myers and the 10th wettest in Orlando. Daytona Beach reported its 2nd wettest day in November since records started in 1923 on the 26th when 6.45" of rainfall was recorded. There were multiple 24-hour precipitation records broken for the month (Table 2). Table 1. November precipitation totals and departures from normal (inches) for selected cities. Figure 1. A graphical depiction of the monthly rainfall departure from normal (inches) for November is given in the figure below (courtesy of NOAA, NWS). Here are the CoCoRaHS rainfall totals for November from some select CoCoRaHS stations across the state. 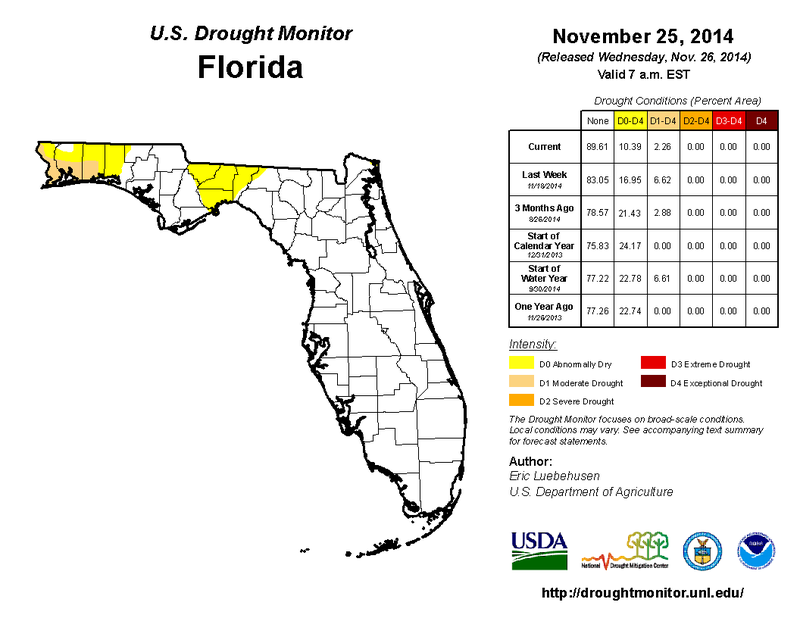 At the end of October, moderate drought (D1) conditions had been removed from eastern Big Bend counties (Madison and Taylor counties) but introduced in Franklin, Jackson and Liberty counties and much needed rainfall caused the removal of the dry conditions from the west coast and central Florida. November started off very dry for the state, with the first observed rainfall (less than 0.50") coming on the 6th of the month in Miami-Dade County. Because of the continued lack of rainfall in the Panhandle, D1 conditions were added to coastal portions of Escambia, Santa Rosa and Okaloosa counties. Widespread rain along central and south Florida at during the middle of the month, helped keep drought conditions in check. Near the end of the month, heavy rains across portions of the Panhandle and Big Bend reduced the D1 conditions to abnormally dry (D0) in Gadsden, Leon, Jefferson and Wakulla counties. As of December 1st, Lake Okeechobee was at 15.57 ft., and a few river levels are elevated from the rains during the week of Thanksgiving.